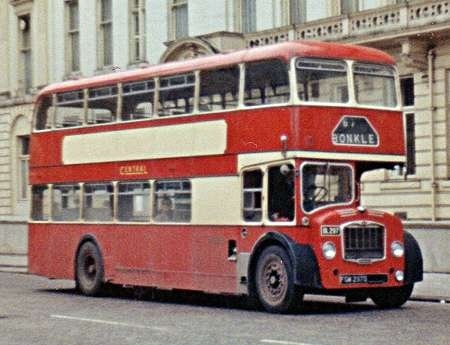 This photo taken in Glasgow in the late sixties is not very good quality but the subject is quite unusual inasmuch as it was one of a batch of forty bought by Central SMT built to a length of 31ft 6in with a seating capacity of 76 arranged as H44/32F said at the time to be an attempt to match the Atlantean/Fleetline of that era. The extra length was all behind the rear axle as can be seen by the longer rearmost side windows on both decks and the extra long rear overhang. I believe the only other company to take delivery of this extra length version of the Lodekka was Eastern National some of which may have been used on the Southend – London service, of course around this time the VR was making it’s early appearances and we all know what the Scottish Bus Group thought of that model after a very short experience. The extra length doesn’t harm the proportions of the classic ECW design at all. The Eastern National versions were equally good looking and were used extensively around south Essex but the Central SMT colours enhanced the design just that bit more. Eastern national took the extra length FLFs in both coach and bus versions. There is an Eastern National Omnibus photo pool on Flickr which shows both versions. Initially ENOC used their 31′ FLF (F and G reg) semi-automatic buses on the 151/251/351 routes from Southend/Chelmsford to London (Wood Green), and of course from Canvey to London (WG) when the 151 was diverted there in April 1971. A couple even featured in the series On The Buses. The coach versions were used on the Southend to London (Kings Cross/Victoria) X10 service and of course this service’s variants. In their later lives with ENOC the buses were used all over Essex. Of this last sanction (236) the last chassis produced was 236.337 and still exists today in the form of AVX 975G (ENOC 2614). This coach was downgraded to bus status and re-numbered 2946. It has been preserved in its original state as 2614 and is still active today. All were, I think, Gardner 6LX powered, with the ENOC vehicles having semi-automatic transmission. The reason for the variation between 78 and 76 seats on the SBG vehicles was to allow additional luggage space on the 76-seaters – but why were ENOC so conservative in specifying only 70-seats on their bus versions? . . . in fact why not just order "standard" FLFs?? And, and . . . I’ve only driven a Lodekka twice, but I just thought they were horrible. Why did Bristol adopt that raked steering-wheel, which made one feel one was sitting – uncomfortably – in, rather than "on top of" the vehicle. AEC managed a "flat" steering wheel on the Bridgemaster and Renown (Albion’s Lowlander doesn’t count as it just used the standard Leyland Titan front-end). Yes, the "semis" did have the stairway reversed from the normal front-entrance Lodekkas – and it was cream and rather plasticky compared to their green. It also had an enlarged blunderbus compound. In my day, semis were number coded as "29xx", 70-seat Front Entrance were "27xx" and "28xx", 60-seat rear open backs were "24xx" and "25xx", and IIRC "Big Bertha", the only 70-seat open backer was "2601", operating from Brentwood depot. We also had one drop-floor 4-abreast still about, which was number coded "23xx".